The cycling season started off with a bang this weekend. Well, actually, if you want to simulate the sound of a bike crash, take a drawer full of silverware and drop it on your patio. Then follow that with your favorite exclamation of pain. Professional riders in the Tour de France refer to crashing as "touching the floor". In pretty much every situation, you do not want to touch the floor. I touched the floor this Saturday. And not some casual slip where you lose control and end up in the bushes crash, a genuine smack-into-the-asphalt-end-up-in-the-emergency-room crash. If I were a car, I'd have probably burst into flames. Thankfully, I did not spontaneously combust on impact. We were near the end of our 55 mile ride. I was traveling along a flat road. I was in the bike lane but I wanted to turn left at the upcoming intersection. 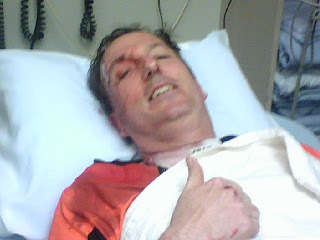 I had my right hand on the handlebars and I was looking over my left shoulder at the traffic coming from behind. At that moment, my front wheel hit a bump in the pavement, which caused me to pitch forward. Since I only had one hand on the handle bars, when I pitched forward the right hand pushed my wheel sharply to the left. Since bikes do not roll very well when one wheel is perpendicular to the direction of travel, my momentum flipped me right over the handlebars and onto my shoulder, arm, face, hip, and knee. I actually don't remember this part of the accident. The first thing I remember is lying on the ground and having several people talking at me. I could think of three things - "I have to get home because we have dozens of people coming over for a party. ", "How's my bike, I just need to get up and walk around to feel better. ", "Why is somebody pushing his thumb into my temple?" My wife, Sherri, had decided to take an alternate way home from the store after picking up 3 bags of ice for the party. Quite coincidentally, she came upon the scene of my accident shortly after it happened. She was a little dismayed by the scene. From her description, it sounded like a scene from a Dracula Gone Wild film. Apparently, there was quite a bit of blood on me and on the pavement. I can only suspect it was my blood since I doubt anyone came along and threw blood on me like some PETA protester would do. Since I wasn't wearing a fur bike jersey, it's safe to conclude it was mine. Apparently when I crashed, absorbing the blow with the right side of my face, my sunglasses hit first, cracked, and put deep gash right above my right temple. It occurred to me later, "That's why someone was putting his thumb in my temple earlier; he was trying to stop the bleeding." The fine folks in the emergency room attended to my cuts and scrapes. They firmly washed the road rash and took a wire bristled brush, that's used for removing loose paint from your walls, and scrubbed any bits of asphalt from my wounds. I didn't actually see the brush they used, but from my tactile experience, it could only have been a steel brush or a small bed of nails. 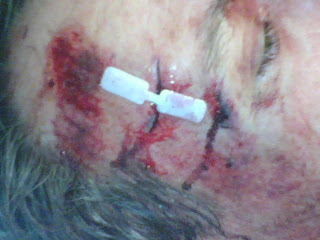 The fine doctor cleaned the gash in my head, sutured me up and had me cool my heels for a bit. While I was in the ER with Sherri by my side, people were showing up at our house for the potluck we were hosting. Sherri called our son, Rob, and asked him to be the party host. Every chance I got, I told the ER folks that I had to get to a party. They made some sympathetic comment, and as soon as they got out of earshot, they said, "he needs to stay another 45 minutes. " By the time we got home, the party was ove r and the guests were gone. Rob had set aside a couple plates of food in case we were hungry. Well I certainly was and I appreciated it. The next day I took my broken bike to the shop to repair the broken handle bars and to check it for any structural cracks. Of course I had to get new helmet too, since my old one had done its job and was now ready to be retired. Let's see broken handlebars, new brake lever hoods, new tape, new jersey, new bibs... $$$! I also went to the scene of the accident. The bump is nothing more than a 4 or 5 inch bump in the bike lane caused by a nearby tree root. Any other time, I'd just roll over it. But when your not focused on the road, it's enough of a deviation to put you on the floor. After my last update, several people asked about getting raffle tickets. Here's what you need to do. You send me a check made out to me. I will send you raffle tickets and a receipt from Team in Training thanking you for your donation and verifying that your contribution was to a charitable cause. If you'd like to make a donation, contact me at steve asche if you'd like to see what's being given away, go to Death Ride Fundraising Raffle. You wear purple so well. Matches your vest. Glad you see you're smiling and still selling raffle tickets. That makes you the very best community captain in all of TNT!